It's been a while since I've shown flowers, so here's a colorful corner of the shop. 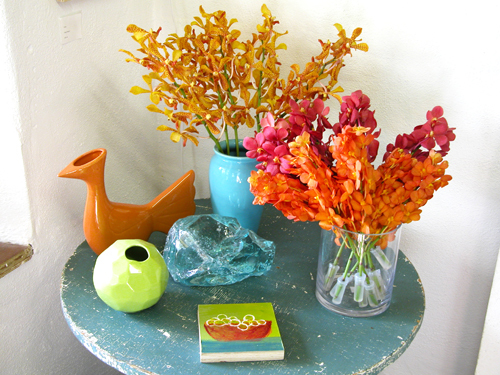 The mokara orchids—in shades of orange and red—look great alongside the whimsical orange bird vase, a lime green snowball vase, a chunk of blue glass and a painting by Candace Morgan. Not shown, but equally as wonderful this week, are bright red ranunculus, parrot tulips and dahlias.